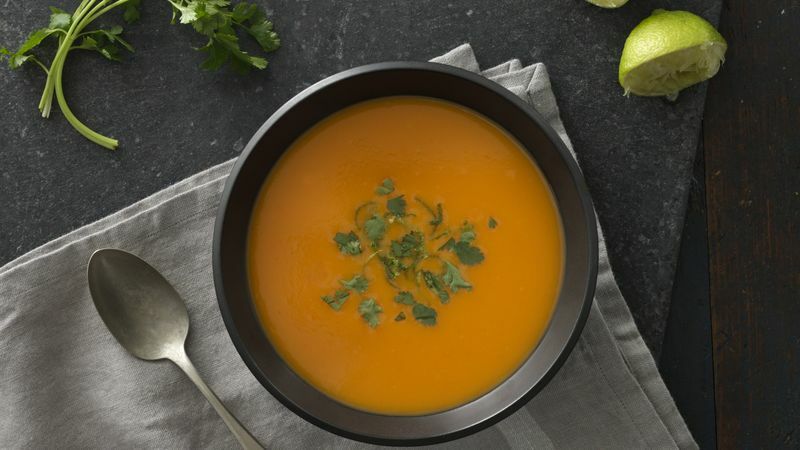 Fresh gingerroot, coconut milk and Progresso™ vegetable broth provide a unique flavor foundation for this sophisticated, but easy sweet potato soup. In blender or food processor, place half of the soup mixture (see tip). Cover; blend on high speed until smooth, scraping down sides if necessary. Puree soup until smooth. Repeat with remaining soup. Return mixture to saucepan; beat in coconut milk and lime juice with whisk. Reheat 5 minutes over medium heat (do not boil). Ladle into serving bowls; garnish with sprinkling of lime peel and cilantro leaves. Reduced-fat (lite) coconut milk can be substituted for regular coconut milk. To get a beautiful, vibrantly colored soup, make sure to use orange fleshed sweet potatoes. Use caution when blending hot liquids. Allow soup to cool slightly, and be sure never to fill the blender or food processor over halfway full. It’s best to cover the top of the blender or food processor with the cover or a towel to prevent any soup from splattering.